With the release of Dwight H. Little's live action Tekken flick right around the corner we thought we'd share the film's new trailer which is a little better than the first one and shows off a bit more of the apocalyptic world the film is set in. The year is 2039. World Wars have destroyed much of civilization as we know it. The remaining territories are no longer run by governments, but by corporations, the mightiest of which is Tekken. In order to keep the masses down, Tekken sponsors the Iron Fist Tournament in which fighters compete to the death for ultimate glory and receive a lifetime of stardom and wealth. Stars of note include Luke Goss, Gary Daniels and Cung Le. Thanks to 28DLA for the heads up. 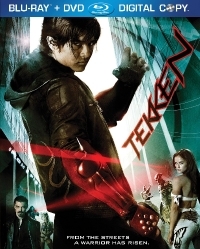 Pre-order Tekken on Blu-ray. It arrives July 19 2011 from Anchor Bay Entertainment.